Both aroma and taste are clearly influenced by the Las Vegas Lemon Skunk genes; a fruity, spicy aroma. The taste is that of lemon-zest and pineapple. The Lemon OG Haze high is a wonderfully delicately balanced body and activating high. 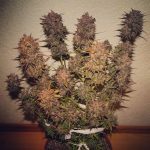 This entry was posted in Strain review and tagged Lemon OG Haze, Nirvana Seeds, REVIEW, seeds. Bookmark the permalink.